We have collected and analyzed 5 expert reviews from international sources. Experts rate this product 85/100. The average review date is Jan 21, 2015. We have compared these reviews to 5741 reviews from other Smart Lighting. The alaScore™ for this product is 87/100 = Very good. Last update: Apr 20, 2019. Cree Connected LED brings smart lighting to the masses with an affordable bulb that's simple to set up and control, and casts a very pleasant white light. 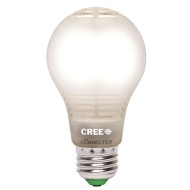 The Cree Connected LED boasts solid lighting specs, strong ease of use, a wide range of control options, and a terrific price point. Unlike standard Cree LEDs, the new connected bulbs won't dim very well on dimmer switches due to interference from the built-in Zigbee dimming smarts. Also, the all-plastic aesthetic might not appeal to everyone. With tried and true hardware inside the bulb and smooth performance on multiple platforms, this $15 smart bulb is a smart bet for connected lighting.